Ah acai. That delicious purple fruit that has gripped our hearts (and our Instagram accounts). With options ranging from decadent, almost-desserts to uber healthy kale infused bowls of goodness, it can be hard to choose which acai bowl to bless your tastebuds with. Luckily for you, we've done the leg work and found the very best acai bowls in Brisbane to sate your appetite. All you have to do is pick one (or five, we would never judge) and dig in. What can we say, we’re givers. Ready to get your acai on? 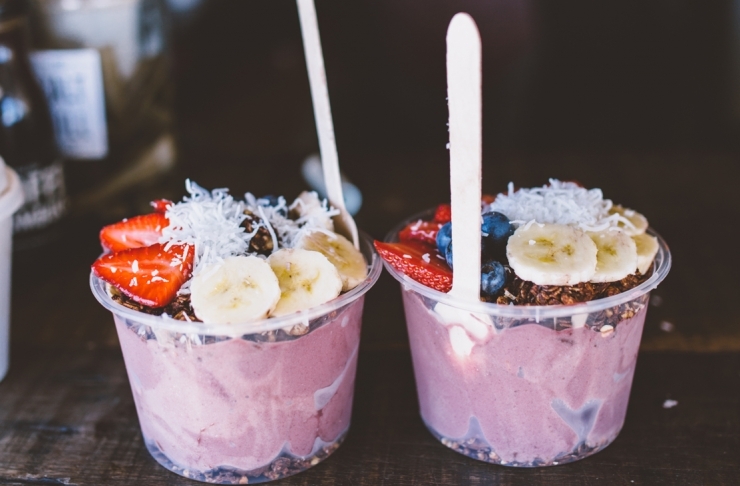 Here’s where to find the best acai bowls in Brisbane. If acai is what you’re craving, you can’t go past a classic choice: Kiss The Berry. Located at both South Bank and in the CBD (with locations down the Gold Coast, too! ), their ever-changing menu pairs the best seasonal produce with hand-made granola and a variety of toppings. Our current favourite is the Apple Crumble Bowl: featuring a blend of banana, apple juice and cinnamon topped with stewed apples, coconut yoghurt and walnuts. Our stomachs are growling just thinking about it. Chances are that if you live in Brisbane you’re just around the corner from an Acai Brothers store and all the deliciousness held within. Boasting to be the fastest growing superfood bar franchise in Australia, Acai Brothers might just be the kings of acai. Order their Raw Jaffa Bowl, infused with orange essential oil, and try not to scoff the lot in ten seconds flat. You can thank us later. Teneriffe staple Evolve Organics started life as a humble juicery but since their expansion into a full blown organic cafe they’ve earned a reputation for delivering the goods in the taste department. But vegan quesadillas aren’t the only thing on the menu, Evolve also dishes up a mean acai bowl. With every dietary requirement catered for, from gluten free to vegan, you can customise your bowl of goodness to your heart’s content. Gourmet restaurant-come-wholefood-supermarket The Farm Wholefoods knows a thing or two about putting together an epic acai bowl. Their signature bowl combines acai, cacao nibs, cinnamon and dates blended with coconut water before topping it with buckini (activated buckwheat and not a questionable male bikini). Plus, you can totally pick up some organic groceries while you’re at it. Now that sounds like a win-win. Coco Bliss’ acai bowls are perfect for an acai craving on the fly. With a bazillion Brisbane locations and topping options to pimp out your bowl, Coco Bliss never fails to please. Opt for the Bounty Bowl, complete with chocolate coconut yoghurt and clean chocolate fudge sauce, for an indulgent twist on everyone’s favourite superfood. Serving the good people of north-west Brisbane, Kokobana Superfood Café knows a thing or two about whipping up a mean acai bowl. Menu highlights include the Nutter Bowl, featuring hazelnuts and clean Nutella sauce among other acai bowl staples, and the Peanut Butter Jelly Time, made with organic peanut butter and strawberries. And don’t even get us started on the classic Kokobana passionfruit acai bowl. Be still our beating hearts. A favourite among West End locals, Miss Bliss Wholefoods Kitchen isn’t just the god-sent purveyor of bliss balls. They are also the team responsible for the signature Miss Bliss acai bowl, which combines banana, seasonal berries and coconut water with mouth-watering Miss Bliss granola. Do you want to know the best part? The aptly named Bliss Bowl is entirely vegan and gluten free, so you can order as many as you like without the guilt. Now that sounds like a win-win to us. Pineapple Express, located in Fortitude Valley, is everything we love about Brisbane’s café scene, melding fresh ingredients with that good for your insides philosophy that makes us feel a little bit better about smashing five pieces of avo on toast (let’s be honest, we’ve all been tempted). Pineapple’s acai bowls are no exception to this rule, with their flavours pulling together the best local produce for one killer acai experience. Our go-to has to be the Pretty in Pataya, perfect for those sunny winter days Brisbane is blessed with, which combines pink dragon fruit, pineapple, mango and Coyo ice cream with shaved coconut and seasonal fruit. It’s just like a tropical island vacay in an acai bowl. Café-come-hot-chocolate-wizards-come-women’s-clothing-store (yes, you read that right) Denim Co. is more than just the perfect South Bank spot for an early morning pick me up. You can also score yourself a sweet acai bowl to enjoy against the backdrop of the meandering Brisbane River. Denim’s signature acai bowl comes topped with house-made granola and makes the perfect accompaniment to their rich AF Italian hot chocolate. Everyone knows calories don’t count before 11, right? While Raw Juicery is probably better known for its nutrient rich juice and smoothie options, their acai bowl offerings are definitely nothing to scoff at. Menu highlights include the mouth-watering Berry Bite bowl, featuring mango and strawberries topped with gluten free super muesli, and the Tropical Storm bowl, which adds sweet-yet-tangy pineapple juice into the mix. With stores at Bulimba, Indooroopilly, Carindale, Chermside and the CBD, you’ve got no excuse not to swap your daily doughnut run for an acai bowl instead. Go on, give your body this one. The sister to other Brisbane favourites like Pawpaw and Piggy Back (of rainbow coffee fame), Picnic Café delivers the perfect acai bowl with a twist. While most acai bowls will blend coconut water into their mixture Picnic adds almond milk instead, resulting in a creamier acai texture. They then add granola, banana, coconut and other seasonal fruit on top; just in case you were thinking things couldn’t get any better. Think of it as more of an acai yoghurt experience that hits all the right notes. Be right back, we suddenly have to make a trip to Picnic. Southsiders, you are so lucky. Charlie’s Raw Squeeze is informally known as the mecca of all things healthy in Brisbane and you can bet they understand how to take acai bowls to a whole new level. Their signature green bowl is like a health shot in food form, combining traditional acai ingredients like banana and coconut chips with frozen kiwi fruit, frozen kale and supergreens powder. In other words, it’s the perfect post-junk food-bender cleanser. Who ever thought frozen kale could be so appealing? While it can be hard to go past the cake cabinet (vegan black forest cake, anyone?) at Sol Natural Foods, trying out their much raved about acai bowl is definitely worth your while. Think cinnamon-spiced granola, a hand-prepared fruit skewer, fresh passionfruit and drool-worthy Coyo coconut yoghurt. Since Sol specialises in vegan and vegetarian health foods, with gluten free needs also able to be catered for, you can bet this acai bowl is not only nutrient-heavy but also packs a punch in the flavour department. Acai doesn’t get much better than this, guys. 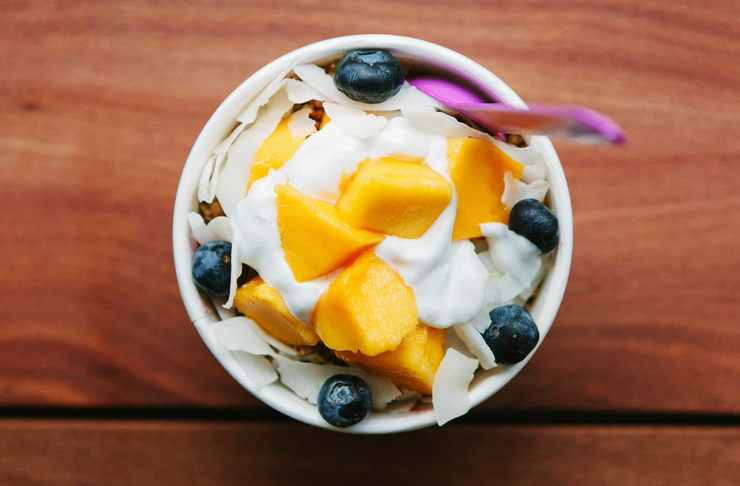 We know what you’re thinking: how does a specialty coffee joint in the suburbs of southern Brisbane get a mention on a list of Brisbane’s best acai bowls. Well, to that we say three words: chocolate buckini clusters. Yup, that’s right, the legends over at Blacksmith Specialty Coffee, located in Mount Gravatt East, have added chocolate into your favourite acai build in lieu of the more standard granola because clearly we all needed that in our lives. Now you can get the best specialty coffee south of the river and a killer acai bowl all in one place. Sign us the heck up! Sitting alongside iconic The Roastery Café menu items like the breakfast burger and Mediterranean breakfast board – complete with chorizo and spicy peppers - is the Roastery’s take on the humble acai bowl. Banana, coconut water, granola, berries and chia seeds all go into the Roastery’s raw cacao acai bowl, which also happens to be totally gluten free. You won’t find any bells or whistles on this South Brisbane favourite, just good ol’ fashioned acai goodness. Sometimes, that’s just what we need. Brisbane, you know what to do. Want to sink your fangs into something a bit more substantial? Make sure to check out Brisbane’s very own burger festival.